Vincent M. Lancisi belted out that greeting one afternoon last week, when he walked into the lobby of Baltimore’s Everyman Theatre, where he is artistic director, and saw Timothy Mackabee sitting on a bar stool. Lancisi is a bit portly, with bushy gray hair, and he was carrying a bag of rehearsal paraphernalia. There was a Santa Claus-like air about him, but instead of passing out gifts, he recognized that having Mackabee back working at his theater for the third time is enough of a present. Mackabee, a 32-year-old Parkville, Md., native who has designed for Everyman and Center Stage in Baltimore and Studio Theatre and Theater J in Washington, made his Broadway debut with a full-length play Sunday with a revival of “The Elephant Man.” It stars Oscar nominee Bradley Cooper as a disfigured Victorian carnival attraction who is rescued by a prominent physician and who takes up residence at a hospital, where his curious ­higher-class visitors include an actress played by Patricia Clarkson. When Mackabee first signed on to the project, he knew only that he would be designing an unspecified play for director Scott Ellis at the Williamstown Theatre Festival in Massachusetts. Throughout his 20s, Mackabee spent several summers at the Berkshire venue’s props department, and the artistic staff had taken note of his successes since earning his MFA at Yale. Now having attended a Broadway opening that attracted a celebrity sideshow’s worth of film, theater and television stars, Mackabee is back in Baltimore and putting the finishing touches on the set of “Deathtrap,” a 1970s thriller about a mystery writer who keeps a large gun collection at what Mackabee calls a “cozy, sweater-weather Connecticut cottage.” There’s stuff everywhere — books, guns, vases, more guns, a suit of armor and various weapons used by the Teenage Mutant Ninja Turtles. But it’s all very organized. The stage directions in “Deathtrap” are specific — the protagonist might be instructed to pick up a paperweight from his desk with his right hand — so “Deathtrap” was not the sort of play that let Mackabee create his own onstage world as he did in “The Elephant Man,” with its four-story, paneled back walls and sliding curtains. Mackabee has paid close attention to detail since he was a kid putting on puppet shows. He began experimenting with set design while growing up near Baltimore, where his plays starred McDonald’s Happy Meal toys. At his urging, Mackabee’s family traveled to Washington to see touring musicals. (Most memorable: “Titanic”; lousy script, great shipwreck, he says.) He saw Shakespeare Theatre plays on field trips. “To this day, one of the best productions I’ve ever seen was ‘A Woman of No Importance,’ as directed by Michael Kahn and starring Dixie Carter. I’ve told Michael Kahn that, but he still hasn’t hired me,” Mackabee said. 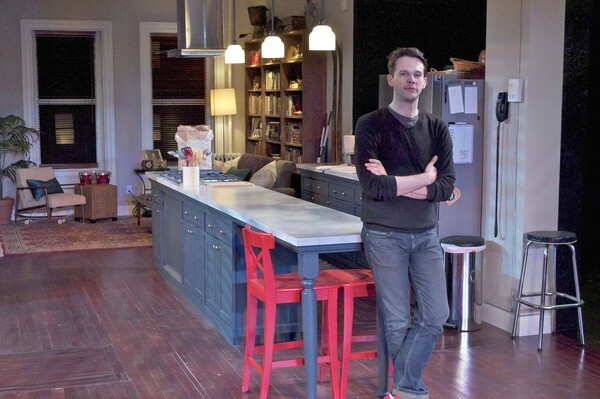 Baltimore-born set designer Tim Mackabee created the set for he domestic drama unfolding on the stage of Everyman Theatre these days in Michael Weller's "Fifty Words" can get pretty messy — stories about marriage frequently are. But the set that the two actors in this play get to inhabit is a study in calm, careful planning and execution. That set is the work of Tim Mackabee, who is making his local professional debut as scenic designer with this production. It's a particularly satisfying homecoming for the New York-based Mackabee, who was born in Baltimore, raised in Perry Hall and attended the Carver Center for Arts and Technology, the magnet high school in Towson. "I had teachers who did nothing but support me and tell me that I could do this my entire life," said Mackabee, 30. His resume includes work as associate scenic designer on such high-profile Broadway shows as the musical "Fela!" and a revival of the Pulitzer Prize-winning "'night, Mother," as well as the original off-Broadway production of "[title of show]." His credits also boast a long list of shows he created sets for in New York and in regional theaters. Mackabee's career is not surprising, given that he started aiming for it a long time ago. "I had a puppet theater when I was 3 and made play set designs as a kid," he said. "I had a little stage in the basement. Happy Meal figurines were the actors. I would place TV trays on top of a dining table and make construction paper curtains. If you ever want to find incriminating stuff about me, find the VHS tapes of me doing that in Perry Hall." This interest in creating the magic of theater never abated through elementary school and on to Carver, where he graduated in 1999. "I had so much fun there," Mackabee said. "I was surrounded by other people who were doing what I wanted to do. I was always at school working on something. My mother would be outside in a car waiting for me at midnight, as prisoners at the jail next to the school would be tapping on the windows." Paul Daugherty, former head of theater and director of admissions at Carver, recalls Mackabee fondly. "When he came to the school, it was clear he had a bright light and was very self-directed," Daugherty said. "He was just innately talented at design issues, one of those kids you don't really teach. You just stay out of their way. And with Tim, it was always about the play and about the ensemble. You didn't have to tell him that. He just knew as a young kid." After earning a college degree at the North Carolina School of the Arts in 2003, Mackabee moved to New York and "assisted on a lot of small shows," he said. "Then I reached a ceiling." To help break through, he took the advice of a colleague and entered Yale University, where he received his master's in set design in 2009. For "Fifty Words," Mackabee seized on a key factor of the play, which is the story of couple who get to spend their first night alone in their Brooklyn brownstone in years while their young son is away at a sleepover with a friend. "I wanted a place where two people can be confined in a real space, where there is no way out," the designer said. "It's a super-realistic set. This was a very good show for Craig's List — there was lots of rummaging for tchotchkes." The theater has been reconfigured for this production, with seating on three sides of a long, narrowly rectangular stage. Some people in the audience will be unable to see all the details filling out the upstage area. But as was the case with Neil Patel's painstakingly detailed set for "American Buffalo" at Center Stage earlier this season, any visible item in Mackabee's design — smoke alarms, children's games stuffed under a window seat — can conjure up the total picture. "It's a real treat to have Tim come home to design for our stage," said Everyman artistic director Vincent Lancisi. "Tim is a perfect example of Baltimore theater artists who have been trained and nurtured here, and have gone on to do great things on the national stage. His set design for Everyman Theatre is sublime." "Fifty Words" runs through Feb. 19 at Everyman Theatre, 1727 N. Charles St. Tickets are $25-$40. Call 410-752-2208 or go to everymantheatre.org.